The competition for iPhone and iPad is stronger than ever, and Apple finally decided to change their product strategy, trying to be the first to introduce a new gadget trend: the wearable technology. Let’s face it, they did not come with a new device for some time. In the last years, they just polished their old gadgets, making those minor modifications look like major improvements. But, seeing Samsung’s sale numbers from 2012, I guess they decided to switch their strategy and went for diversity. Maybe it was about time to innovate and create new gadgets. We love upgrades and iPhone 5 is a great smartphone, but we need to see that spark that made us fall in love with Apple for the first time. Apple rumors appeared all over the Internet, and most of them say that new and cool devices are coming really soon. Along with few variations of the iPhone (some cheaper), they could introduce a new and cool device: The iWatch. As you can expect, “i” used in front of any name is an Apple signature, and means that this gadget is anything but ordinary. If everything goes well for them, a new market will arise: the smart watch market. 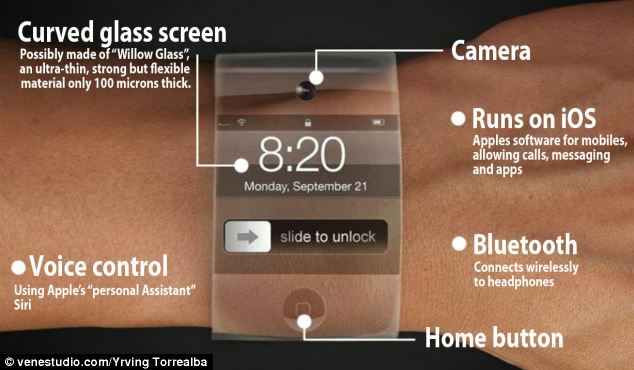 The details of iWatch are still sketchy, but it could feature a version of iOS, Bluetooth and WiFi, a camera, heart rate monitor, curved display made of flexible glass, maps, voice control and a way to communicate with the iPhone. This means that iWatch could become a remote (or maybe a second display) for the iPhone, allowing the user to read messages, make and take calls, maybe using video calling with it. You don’t even need to take your iPhone from the pocket or the bag, because you will be able to do everything from your iWatch. Some rumors say that Apple gathered a large number of designers for this project (around 100), and all the sings points out that iWatch is almost in the production phase. The assembly process could be carried by Foxconn, the Chinese contractor that works with Apple on iPhone and iPad projects. The smart watch technology is far from new, but, as always, Apple has an unique ability to tweak existing tech in order to make it desirable and fashionable. For the iWatch, I think they will go for miniaturizing everything and trying to put as many features as they can into it, while still trying to keep it stylish and cool. If I think about it now, the iWatch represents Apple’s response to Google Glasses, a project that created a lot of buzz recently. It may not be as glamorous and futuristic as them, but the iWatch has a real chance to become more popular (at least in term of sales). Would you buy them?